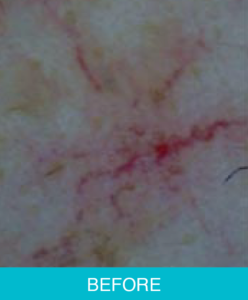 Visible capillaries are dilated capillaries that have lost their elasticity and have become permanently enlarged. They may form linear, or as dots of redness. The name spider vein is given for the spider like appearance of some, with red centers and little tentacles emerging from the middle. 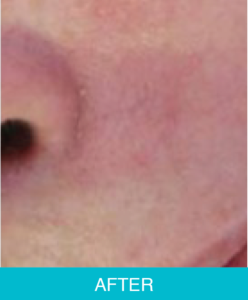 These lesions are commonly found on the face, they often concentrate on the nose, cheeks and chin. The main causes are sun damage, injury, medication and aging. 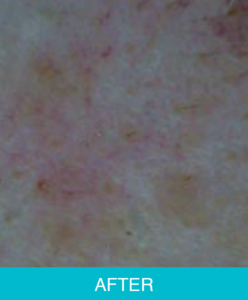 Nearly all fair-skinned people are prone to these unattractive blood vessels, which gradually start appearing in their mid 30’s. Whatever the cause the condition most definitely affects, thin-skinned people. Visible capillaries occur more frequently in women than in men and during pregnancy the increase of hormones and the increase of pressure and volume may temporarily dilate capillaries. Therefore we recommend that you wait a few months after delivery before you begin treatment. Medication such as oral contraceptives containing estrogens can elevate hormone levels and cause dilated capillaries. Long term use of Retin-A, chemical peels and microdermabrasion can also bring about the condition. 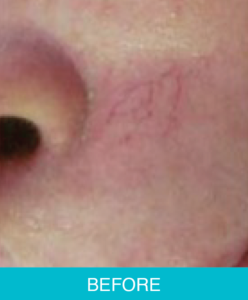 Patients with high blood pressure often have dilated facial capillaries. This condition can be temporarily improved but not cured, as dilated vessels will continue to form because of the high blood pressure. Alcohol, a diet of spicy food and extreme temperature changes are often cited for causing dilated capillaries. Heredity seems to play the most significant role in the development of dilated capillaries in healthy people; it can be seen as a family trait. The treatment of dilated vessels attempts to block the flow of blood in the vessel. Blockage of the capillary is achieved by coagulating a small segment of the vessel. The blood is clotted at the treatment site, blocking the flow of blood. 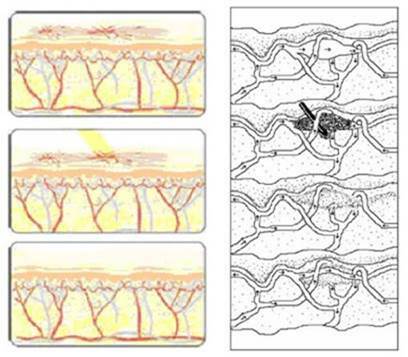 Dilated capillaries of the superficial dermis are essentially dysfunctional. They carry blood, but are too large to nourish skin cells effectively. Therefore, removal of these vessels causes no risk to the health of the skin. When these are removed, new normal-size capillaries grow to efficiently feed the skin. Post treatment the skin will be slightly inflamed for a few hours. Do not rub, exfoliate or have a facial for a week or two after treatment. Maintain normal activities, but avoid strenuous physical exercise for 72 hours. Continue to avoid alcohol, and also avoid spicy foods, tea, coffee, chocolate or tobacco. Avoid aspirin, Ibuprofen (Motrin or Advil), arthritis medication, non-steroid anti-inflammatory drugs or other blood thinning medications for two days after your treatment. These medications will cause increased brushing and possibly delay healing. Always check with the prescribing physician before continuing any type of mediation. Avoid swimming in chlorinated pools for 48 hours, and the ocean for a week, and hot baths and spas for two weeks. Sunbathing and tanning salons should be avoided for at least one week. Do not touch or scratch the treated area. Avoid using soap of foundation for 24 hours. Translucent powder is permissible. Avoid sun exposure 48 hours before and 72 hours after treatment to avoid the formation of brownish spots and also avoid dilation of blood vessels. Do not exfoliate the skin. Let any small crusting fall off on its own. Beware of alternating hot and cold conditions. Think of the coagulation treatment as constructing a barrier against the flow of blood in a vessel, much like a dam holds back a river; a river downstream from a dam dries up, as does the blood vessel. This process works well against capillaries but not veins, because of the difference in the direction of the blood flow. 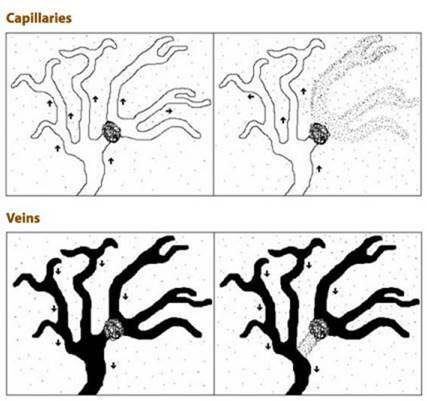 Capillaries in the skin branch out from arterioles and become progressively thinner as the carry blood to the cells. A single clot forms and eliminates the downstream blood, eliminating that section of the vessel. Veins however, join into progressively larger veins as they return blood to the heart. Blood pressure in the legs is greater than the face and increases as the patient stands up and walks. A single clot wouldn’t cause removal of connecting veins; therefore, the treatment would be ineffective. Veins on the legs are referred to physicians who specialize in the removal of varicose and spider veins on the legs. Standard treatments include sclerotherapy, surgery and laser treatments.